This timeless half round / low domed style ring is something that many, many people purchase as a solid gold ring. While gold rings are very easy to repair vs tungsten rings, and have a value that is attached to the gold market – what they don’t have is the toughness to stand up to the wear that a tungsten ring will hold up to. With it’s IPG plating, this is the type of ring that is sure to last you for years to come, and if it doesn’t last you for years to come? Well, if that happens, or you need to resize it, these things are covered by Ring Ninja’s lifetime warranty service, which is the best we’ve seen to date. No up front costs, and it’s included with every purchase of one of these rings on their site, automatically. 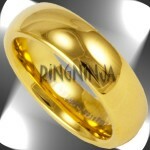 This is our 6MM Domed Tungsten Wedding Ring with 18K gold plating which features a high shine polish. The plating is IPG and is about twice as strong as normal 18K gold. The 6MM Domed Tungsten Ring wiht 18K gold is a popular choice for a wedding band, but can certainly be worn as a great piece of jewelry. This is a great ring for a man or a woman. This ring can also be purchased with our 8MM Tungsten Wedding Ring with 18K Gold Plating to make a great set of wedding bands! If you aren’t swayed by the whole contemporary metal thing, or you don’t think tungsten rings are for you – or you just want something that is more valuable, remember that there is also a great line of plain gold rings that can be found on Ring Ninja’s website!